Good news is that I truly out did myself this year with my Christmas decorations. The bad news is that I had to take him down after 2 days. I had more people come screaming up to my house than ever. Great stories. But two things made me take it down. First, the cops advised me that it would cause traffic accidents as they almost wrecked when they drove by. 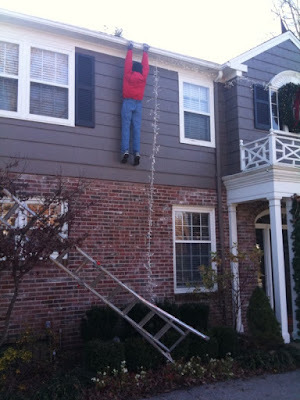 Second, a 55 year old lady grabbed the 75 pound ladder almost killed herself putting it against my house and didn't realize it was fake until she climbed to the top (she was not happy). By the way, she was one of many people who attempted to do that. My yard couldn't take it either. I have more than a few tire tracks where people literally drove up my yard. So it was fun while it lasted! Merry Christmas! My hubby wants to do this next year!?! Have an awesome weekend y'all and get that last minute Christmas shopping done! I'm all about sick and twisted! Really - is there ANY other kind of humour? I posted today about some pranks that my husband and I have done. Someone pointed me to your posting. Have a great day! I'll be back. Too funny! Just think, now when someone really needs help those kind folks will think it's another trick. :) I love your sense of humor. hahahaha, Love it. Maybe if you dress him as Santa ,they might "Get it "
I agree with Lynn (above) that people WOULD get it if this stuffed guy was dressed as Santa. I did get a good laugh from this!! Hi Emily, i love your web site! The little nurse in the family looks just like you, i'll be checking back periodically, all the best to you and yours in 2010. Hahaha! That's great! What a wonderful design! Anyways he is wearing red and that's the motiff of Christmas.